Add a configuration profile that defines the configuration for DataStax Enterprise clusters. 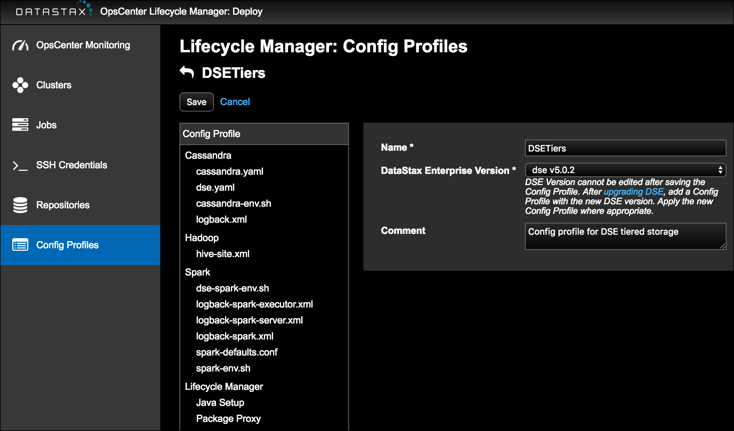 The config profile informs Lifecycle Manager which supported version of DataStax Enterprise to install, configure, and manage. DSE versions 4.7 and later are supported. Note: When you manually upgrade the version of DataStax Enterprise installed on a cluster, you must add a new Config Profile that reflects the actual version of DSE installed and update your clusters, datacenters, and nodes to use the new profile where appropriate. To prevent any potential loss of settings between different versions, the DSE version cannot be edited after saving the Config Profile. LCM jobs fail if the installed DSE version does not match the version specified in the Config Profile associated with a cluster, datacenter, or node. Automated DSE upgrades are not supported in Lifecycle Manager at this time. Note: The data (cluster topology models, configuration profiles, credentials, repositories, job history, and so forth) for Lifecycle Manager is stored in the lcm.db database. Your organization is responsible for backing up the lcm.db database. You must also configure failover to mirror the lcm.db. Note: The data (cluster topology models, configuration profiles, credentials, repositories, job history, and so forth) for Lifecycle Manager is stored in the lcm.db database. Your organization is responsible for backing up the database. You must also configure failover to mirror the lcm.db. From the Lifecycle Manager navigation menu, click Config Profiles > Add Config Profile. The Config Profiles page appears. Required: Enter a Name for the config profile. Required: Select the supported version of DataStax Enterprise (4.7 and later) to associate with the config profile. Note: The DSE Version cannot be edited after saving the Config Profile. If you manually upgrade DSE, you must add a Config Profile with the new DSE version. Apply the Config Profile where appropriate to a cluster, datacenter, or node. Tip: If the OpsCenter machine does not have an internet connection, you can manually update the definitions to access the most currently supported versions of DSE. The Config Profile pane populates with the config files and their corresponding options for the selected DSE version. Optional: Enter a comment about the config profile. For example: DSE 5 Graph. Optional: If there are any configuration files for which you want to override the default values, select the configuration file in the Config Profile pane to access its configuration options. A subset of the configuration options are available for overriding defaults for each configuration file. If you click save without overriding any defaults or customizing settings, the config profile is created with standard and sensible default settings. You can continue to edit the config profile file and run a configuration job at any time. Note: If at any time you navigate away from the Config Profiles workspace after making changes, you are prompted to confirm leaving the page. Click OK to discard your changes and leave the Config Profiles workspace, or click Cancel to retain any changes and remain in the Config Profiles page. When you are done with the configuration profile changes, click Save. The newly added configuration profile is listed on the Configuration Profiles page. An edit and delete option are available for each config profile. Continue customizing the sections of the config profile as appropriate for clusters, datacenters, or nodes. Configure Java setup for automatically installing and managing Java installs and upgrades, and for installing and managing the JCE Policy files (recommended). Configure a package proxy to cache and accelerate package downloads (recommended), isolate DataStax Enterprise clusters offline from the internet, or both. Select the newly added Config Profile and assign it to the appropriate cluster, datacenter, or node in the Clusters Workspace. Edit the cluster, datacenter, or node and select the Config Profile. Run a configuration job to propagate the configuration profile to its targets.